The first and my favourite television series OF ALL TIME. My So-Called Life. 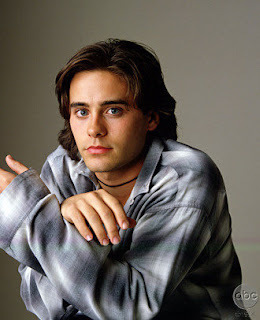 With Claire Danes and Jared Leto as Angela Chase and Jordan Catalano. Rewatching it whilst tweeting about it with a group of friends was Diane's brilliant idea - every Tuesday at 1pm (except for the last two weeks, ack!) using the hashtag #MSCLRW and she recaps the highlights at My So-Called Life Re-watched. 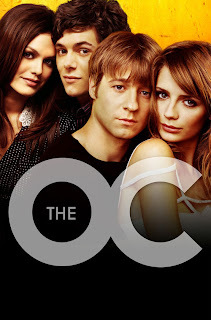 And the second show that I'm rewatching at the moment, is the very dramatic The OC. I never watched it until after the show ended and then I kicked myself for missing out on all the fun. I'm watching it with N and it makes me happy when we have the chance to watch a few episodes all at once. 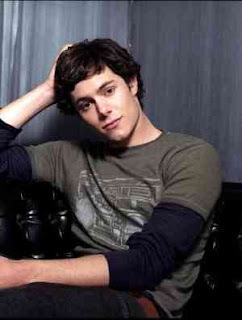 I heart Seth Cohen! And his relationship with Summer and with Ryan and his parents. I love how Sandy and Kirsten are unshakeable as a couple andI find Julie Cooper to be the perfect mix of annoying/manipulative. We're in the middle of season one and thankfully have a long way to go until the end! And because there are two other reasons why I watch these shows, I'm just going to add them here at the end. So that's what I've been watching! Do you have a favourite TV programme you like to rewatch? Do you like the teen dramas? Are you excited about the fall line-up? Let's talk TV. I used to watch (and still do) so many diff shows. I generally rewatch all of Roswell at least once a year! Oh The OC. How much do I LOVE that show!! Lyndsey - I love Roswell! It was a little corny in parts but also such fun! I love the Christmas episodes. Emma - What's Warehouse 13? Never heard of it! I guess I should have mentioned that I'm not great with new/current TV programmes! You really can't beat Dawsons Creek - I heart that show. Must try to watch The OC but have you seen Life Unexpected - have watched the entire series and it's quite good - currently being shown on E4. I just got done watching Veronica Mars. Loved that show, and am very sad its gone.. I have re watched Buffy and Angel so many times.. I never get tired of them! Oh and of course the Gilmore Girls! Love it! 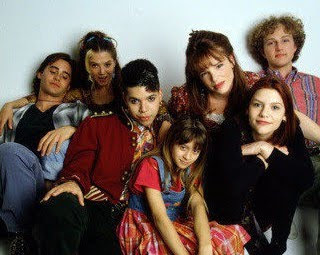 I love My So Called Life, definitely need to rewatch. I rewatching Buffy right now. I'd forgotten how funny it is. Yes totally recomemd Veronica Mars! Yes it is the one with Jack from Dawsons! I like the fact it is a little different from the normal teen drama. I remember Boy Meets World! Vaguely but I do remember. I used to watch all those shows too, Joan of Arcadia...wow. I'd forgotten about all these great programs. There's not much teen drama (that's decent) on today; all I watch is Glee and The Vampire Diaries (Team Damon :D). I'm going to join in the Roswell love because it's one of my favourite shows of all time!!! I have all 3 seasons on DVD and I am always rewatching it because I loved the relationship between Max and Liz :) I wish it could have gone on forever! Janette - I can't say that I've heard much about it, but N came home one night talking about it. Looking forward to it! Liz - I know! I loved Boy Meets World! And Joan Of Arcadia - there's another series I didn't come to until after it had finished (Gilmore Girls is another). And I am with you on the Team Damon! I am presently working my way through the original Beverly Hills 90210 Series. I am on series 6 and can't wait to watch them all. I also have Roswell and Charmed all on DVD, which I love. Vivienne - How fantastic :) I loved the original series of 90210, though I did have to stop watching it once it went up against Party of Five. I was a bigger fan of all the melodrama of PO5 :) I did watched a lot of Charmed as well, but there were SO MANY seasons! And more Roswell love :) Maybe I'll do a post on it one day..
OH MY GOD! I adore My So-Called Life. The scene where Raeanne is acting from Our Town still makes me cry. Andi! Oh my god, SAME! I definitely burst into tears at that scene. But so many before that as well. The episode with The Zit? I cried. A lot. Becky - Yes, thanks for the recommendations from your post, I'll have to look into them :) Was a great coincidence! And Ryan just wasn't very funny. Broody? Yes. Funny? No. And I'll always choose someone who can make me laugh..